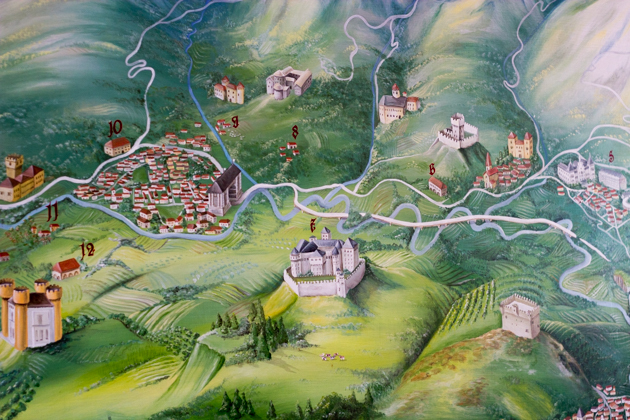 Driving from Milan towards the Alps, at the mouth of the Aosta valley you pass the tiny hamlet of Arnad, where there is a sign welcoming you to the Pays du Lardo (land of lardo). This is enough to make the health conscious wary (although new research indicates we should be more worried about carbohydrates and processed vegetable oils rather than animal fats). 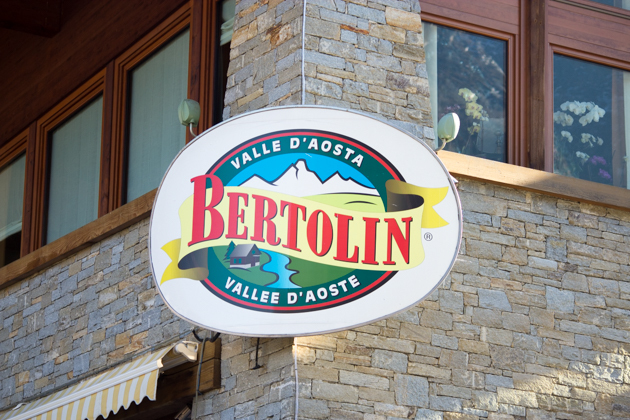 Headquartered in Arnad is Bertolin, an important producer of Valle d’Aosta Lard d’Arnad DOP (translucent sheets of prized pork fat flavoured with herbs, garlic, spices and sea salt and traditionally cured in chestnut or oak casks called doils). Lard d’Arnad DOP has been produced since the 16th century using the fat from the shoulders and backs of local pigs. Pigs are central to life in Arnad. 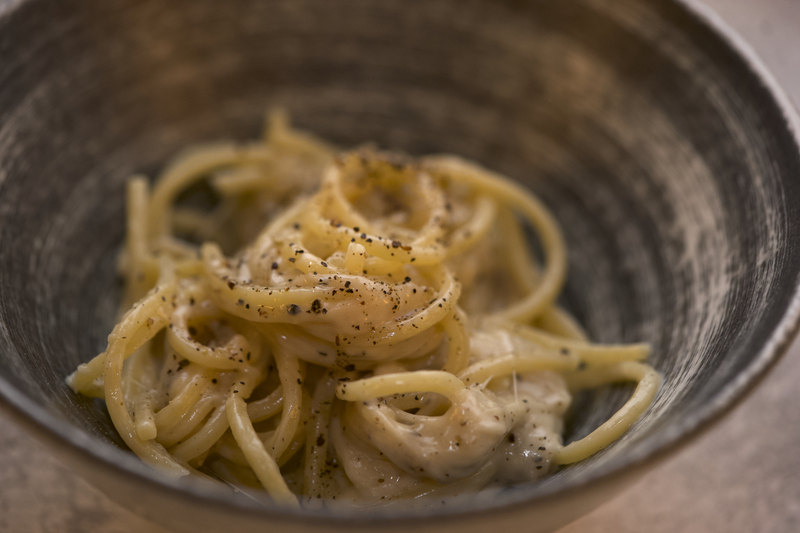 Of its 1,200 inhabitants, most of the families are raising pigs to make this prized lardo. 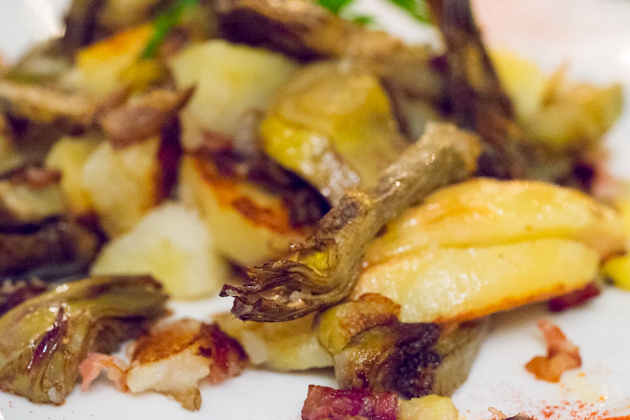 Arnad even holds a lardo festival the last Sunday of every August. 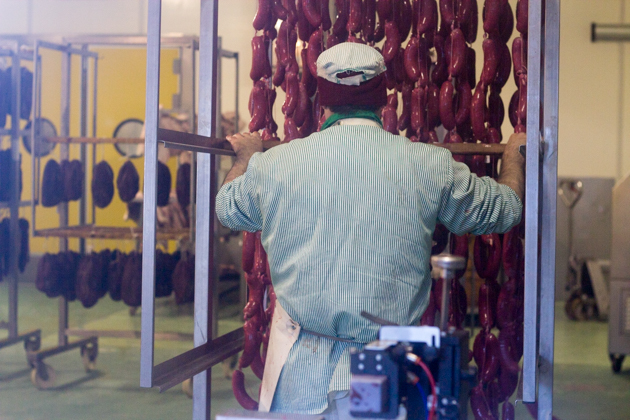 Bertolin began as a butcher shop in 1957 and has expanded to a large producer of Lard d’Arnad DOP run by three generations of the Bertolin family. 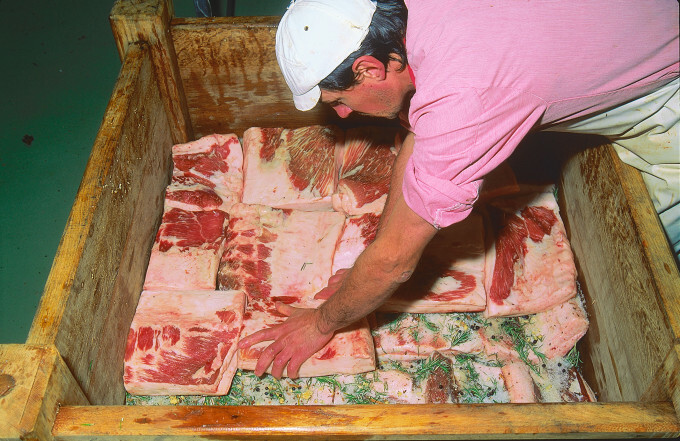 Bertolin begin making lardo using locally reared pigs which weigh at least 180 kilos and are at least 9 months old. 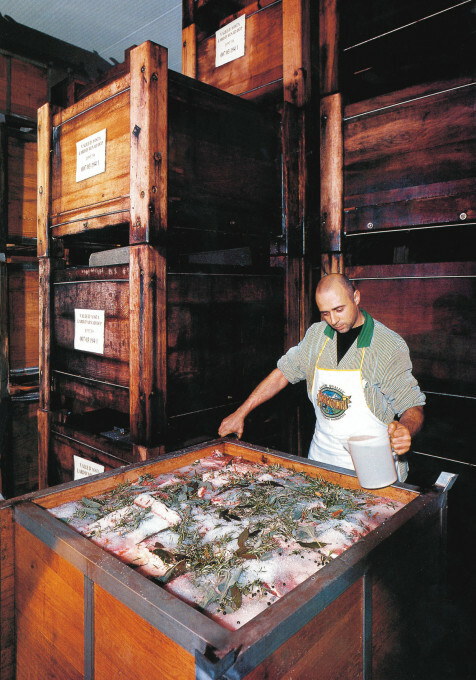 The fat is removed within 48 hours of slaughter and layered with sea salt, garlic, bay leaf, rosemary, sage, achillea (an Alpine herb), cinnamon, juniper, nutmeg, cloves and brine. 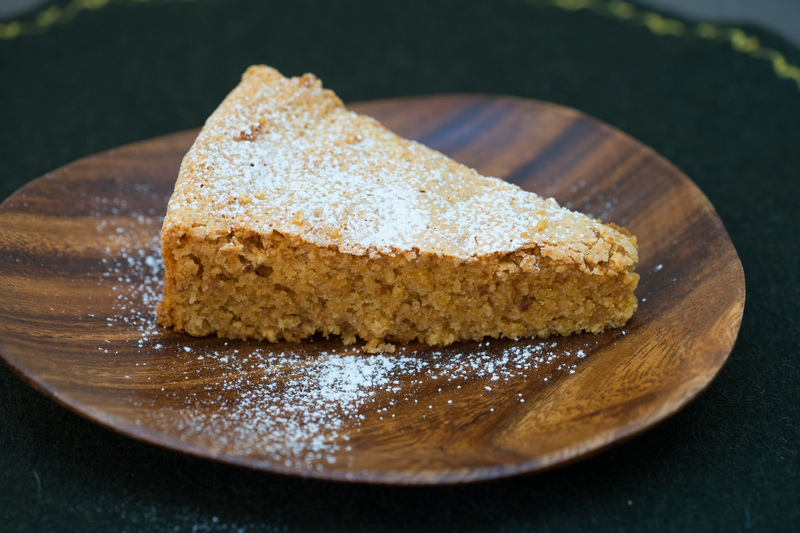 It is aged for a minimum of 3 months in the doils. It can be cured for up to 15 months but then white wine is added to the brine. 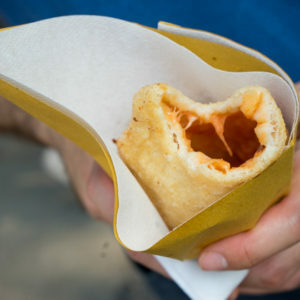 The result is sweet and translucent lardo which melts in your mouth. 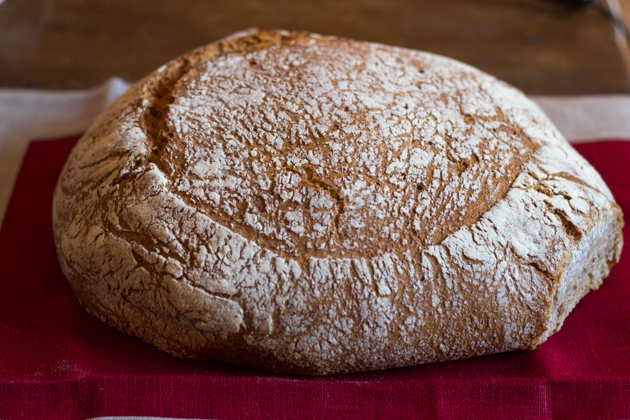 It is sold in chunks ready to be brought home, the skin removed, thinly sliced and served with rye bread and honey. 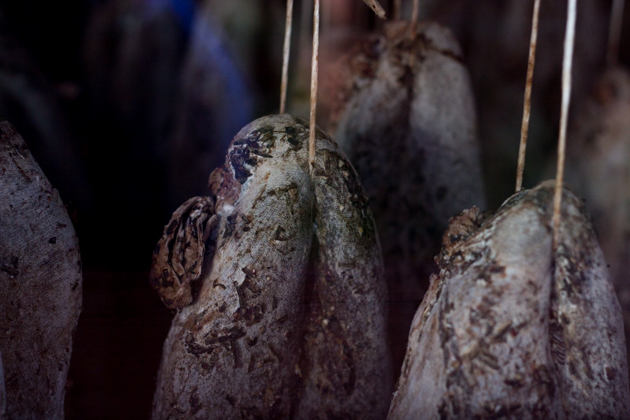 The lardo which does not meet stringent standards to be certified as DOP is sold after aging for 1 month to be used for cooking. 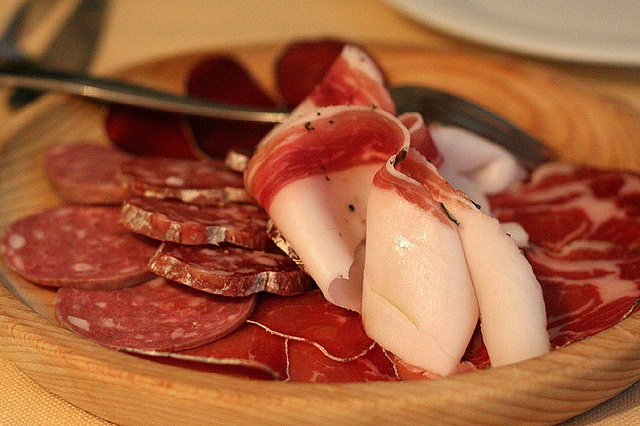 Bertolin also produce many other types of salumi. 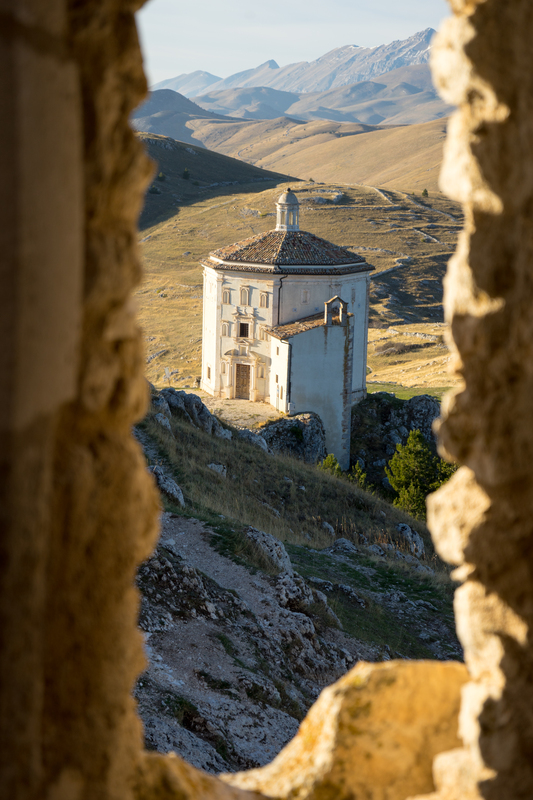 At their factory you can see the entire production from meat carving to the making of lardo and other salumi as well as buy and taste their products. Other local products they produce include teteun/ tetin (cow’s udders pressed with salt, sage, bay leaf, rosemary, juniper berries and wine, dried and boiled to be served with sauces of garlic, parsley and olive oil and fig or raspberry jam, raisins or Martin Sec in syrup), carne salata (Valdostan beef macerated with salt and aromatics), coppa al ginepro (a family recipe for salami using pork neck and shoulder flavoured with juniper berries for 45 days and aged for at least 5 months to be eaten sliced), Reinhold Speck (a local ham from the Walser people in Gressoney valley cured with mountain herbs and smoked with juniper and beech woods and aged for at least 4 months), boudin (pork or beef blood sausage with potato, beets, lardo, garlic, cinnamon, nutmeg, sage, rosemary and juniper; to be eaten raw when fresh or boiled, fried or broiled when aged and served with potatoes) and mocetta (made with different types of meat but is traditionally chamois cured with salt, pepper, garlic cloves, thyme, sage, bay leaf, rosemary and savory in chestnut doils and then aged for up to four months; to be eaten raw). 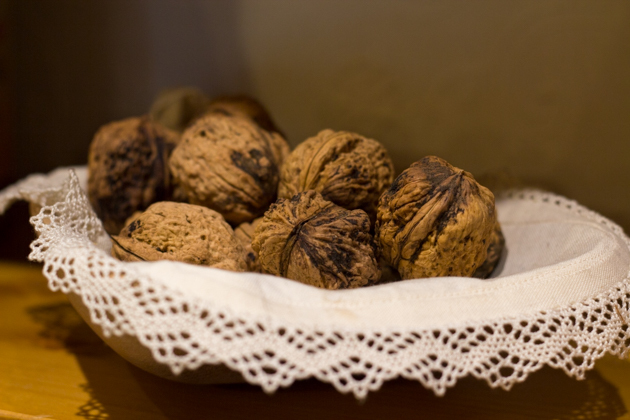 Next door to Bertolin is Dinus Donavit, also owned by the Bertolin family, which produces cold pressed walnut oil (olio di noce). 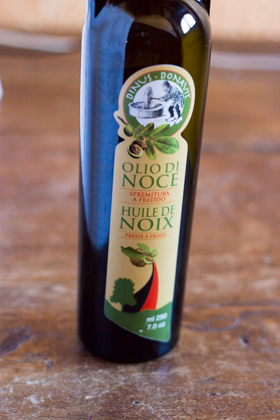 Olio di noce is only produced in Valle d’Aosta where it is cold stone ground and filtered with low acidity. If you do stop in Arnad, don’t miss an excellent bakery, Panificio Carignano, located across the round about from the church. 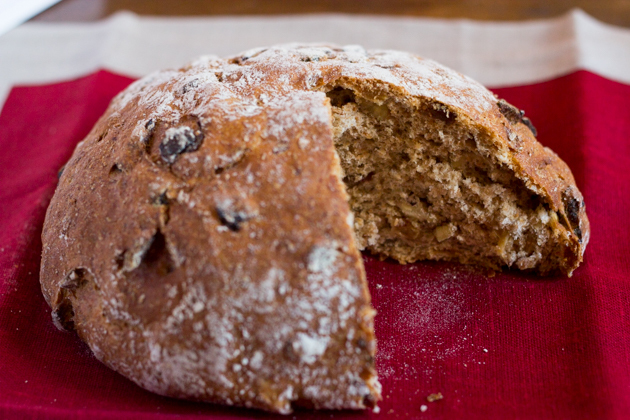 They bake traditional local rye bread (pane nero and pan segale) made with rye flour which can be flavoured with walnuts, dried figs, chestnuts and/or raisins. The perfect accompaniment to Lard d’Arnad DOP. 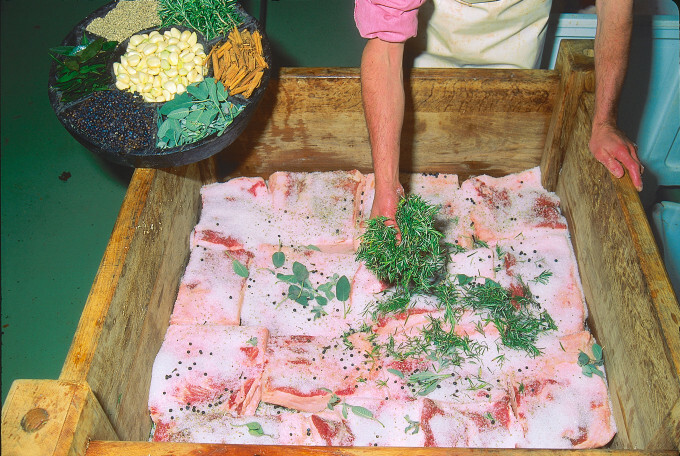 Place the pork skin and Lard’Arnad DOP in the vegetable broth and bring it to a boil until they are soft. Remove them with a slotted spoon and cut them into tiny cubes. Meanwhile boil the beans. Prepare a tomato sauce by finely chopping the onion. Cook the onion in a little olive oil and the white wine. Peel and chop the tomatoes and add to the onion with a few leaves of basil. Let the tomato sauce cook for a few minutes and then add the lardo, pork skin, vegetable broth and 3/4 of the boiled and drained borlotti beans. Let the mixture cook for a few minutes. Puree the mixture and then add the remaining 1/4 of the borlotti beans. Add salt and pepper to taste and serve boiling hot. 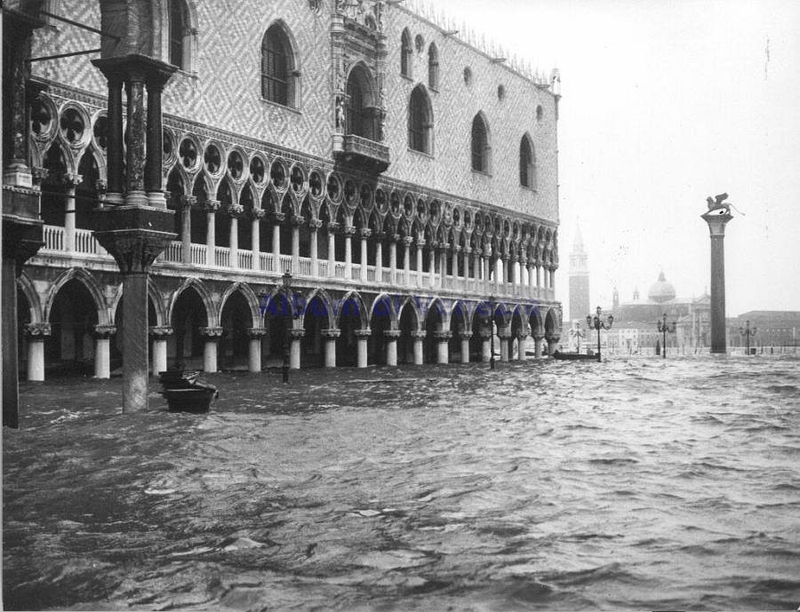 Please note: I have permission to print the photos taken by Bertolin but please do not use them without Bertolin’s permission. « It finally feels like Spring!